After the confusing new wave of The Leisure Hive and the neo-traditionalism of Meglos we finally arrive at a point where most things fall into place and we’re given a traditional story with a new wave spin. Thus begins the so called ‘E Space’ trilogy and more importantly the departure of Romana and K9 as by the end of Meglos we know she’s been summoned back to Gallifrey. Poor old K9 has so far been drowned and kicked and here gets his head knocked off. We get the message, Nathan-Turner. And just for good measure, Nathan-Turner insists on getting the continuity right by mentioning the co-ordinates from galactic zero centre. Just for all those little fan boys out there in 1980. This is one of the first examples of many where there is an active attempt to get as much continuity into the show and this sort of thing has an important bearing on the shape of the series in the next decade. On their way to Gallifrey, the TARDIS falls through a CVE (Bidmead’s roll off the tongue Charged Vacuum Emboitment) or a wormhole to you and me these days. The Doctor and Romana enter E-Space (another universe with negative co-ordinates to our own) and find themselves pitched up on Alzarius at Mist Fall when Marshmen will walk and the Deciders of the human colony based there can’t…well…decide, really. Fan Andrew Smith constructed a neat story with little flab on its bones and it has real pace with an intriguing central mystery. A reverse evolution pandora’s box with an emotional centre that draws upon a great many of the core values and themes from past Doctor Who triumphs as well as nods to SF classics of the 60s – think Planet Of The Apes written by Mac Hulke. The generational themes of the story are also echoed by how the programme itself is attempting to nail its colours to the mast of perhaps a younger audience too with an overt emphasis on young rebellious characters in the narrative including the introduction of a young boy as a companion. Young fan boys…your time is now. And the moral dilemmas surrounding vivisection are also an important part of the themes of conservative scientific exploration. You can't imagine the same themes getting quite the same treatment in Season 17 let's say. It’s engagingly translated to the screen by director Peter Grimwade who eschews much of Lovett Bickford’s visual pyrotechnics in Hive and goes for iconic visuals to get the story told. The location work for the surface of Alzarius is exemplary with the use of coloured gels on the lighting to suggest an alien sun lighting the surface and for Mist Fall and the rise of the Marshmen a superb drenching of atmosphere and use of slow motion work that justifiably makes the sequence of the creatures rising from the lake one of the series’ best remembered. It’s still got a real charge, a proper sense of threat about it and it’s done with absolute conviction despite the rather obvious rubber nature of the creatures, especially in the studio sequences. There’s a sense of place, of community and tradition evoked that hasn’t been seen in the series for some time. Extras are used well to show the Alzarians swimming and collecting food on the surface and then servicing their ship. The Deciders are stick in the mud conservatives, privileged to information that the rest of their people aren’t. Perhaps Smith's pot shot at the incumbent goverment of the day. The Outlers are naïve revolutionaries who can only manage to steal the odd bit of river fruit now and again until the real crisis arrives and self-sacrifice is the order of the day. It’s not just biological conflict that’s going on here – it’s also a potent view of the generation gap and government secrecy. The Marshmen themselves succeed in being more than actors in rubber suits with an obvious attention to detail in the performances and sound effects that erase the painful memories of the Mandrells of just a year since. The death of the Marshchild is in itself a valid dramatic punch, engaging our concerns about these creatures, the emotional underpinning of the supposed bestial threat. We are both scared for the child and ourselves. Doctor Who hasn’t taken this approach for some time and Grimwade’s televisual grasp of the story’s strengths finally make us take the Nathan-Turner re-vamp seriously here. And the music’s calmed down to the point where it isn’t smothering the visuals and is more effectively used to build the mood. This is particularly evident in the rise of the Marshmen sequence. The only disappointment is perhaps some of the acting of the younger members of the cast – Matthew Waterhouse actually equits himself better than some of his colleagues here – and the rather cod spider attack that forms the cliffhanger of episode two. It’s dreadful. Lalla can’t make it work, Grimwade can’t make it work and visual effects can’t either. It should have been so much better. Rather a hamfisted sequence that sits oddly with the rest of the programme. There are some very grounded and much needed character acting turns from the likes of George Baker and James Bree too and Baker himself nimbly strides through the narrative with, at last, a sense of moral outrage and genuine concern as events play out. The evil here isn’t some galactic dictator cracking gags – it’s conservative attitudes, moral panics and scientific stagnation. And what of Matthew Waterhouse? Has there ever been a actor in the programme that continues to be so vilified? (OK, Bonnie's a prime target too). Sure, he isn’t the world’s greatest actor but he initially handles the character of Adric well here and provides the focus for younger members of the audience. It’s only later that when the character’s moral choices become very suspect that he’ll begin to irritate. He works better as a character in direct relation to the Doctor rather than just one of what will be three companions. However, it's Waterhouse's arrogance and rudeness in the commentary on the DVD that is unlikely to endear him to pretty much anyone even now some 29 years later. 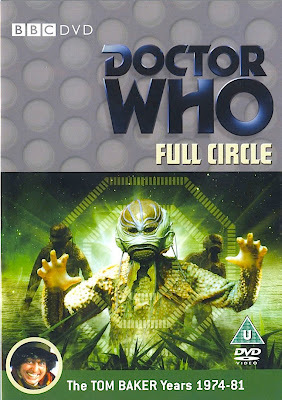 Full Circle demonstrates that Nathan-Turner and the team have finally got a handle on this ‘making of Doctor Who lark’, and certainly, in no small measure here, it’s down to Grimwade marshaling good acting and design, keeping the pace up and serving the story well. It's hardly an original narrative but the team manage to give it a freshness within the Doctor Who format. Commentary – with actor Matthew Waterhouse, writer Andrew Smith and script editor Christopher H. Bidmead. All Aboard the Starliner – cast and crew look back at the making of this story. K-9 in E-Space – a look at the robot dog's role in the E-Space arc. With actors Lalla Ward, John Leeson, script editor Christopher H Bidmead, writers Andrew Smith and Terrance Dicks. Swap Shop – Noel Edmonds chats to Matthew Waterhouse and takes calls from viewers of the Saturday morning entertainment show after Waterhouse's first appearance as Adric. E-Space – Fact or Fiction? - Could E-Space really exist? A look at the science behind the concept of Exo-Space featuring script editor Christopher H Bidmead, visual effects designer (and Fellow of the British Interplanetary Society) Mat Irvine, authors Stephen Baxter and Paul Parsons, planetary scientist Dr Andrew Ball and astronomer and television presenter Sir Patrick Moore.